Hope you all are doing great. First of all, I want to thank you everyone who participated in my First ever Giveaway. It was so much fun for me that I want to do another giveaway soon. So stay tuned. Now, about today's post. Have you started thinking about this New Year's Eve outfit yet? If not, let me show you 5 festive dresses for that special evening. NEED a sequinned piece in my wardrobe! I love dresses! All year round! You picked some very nice ones. In love with all your picks! Sequins are so perfect for the holidays. The Topshop one is my fave. I love that RL off-the-shoulder dress! That would be perfect for a NYE party! What a gorgeous election, Nina! My favourite is the TopShop Body Con sequin dress, it's so stunning! I loved Topshop and Leith dresses, cause I normally wear light colors on New year's eve, and lack on Christmas. A personal tradition :) So I loved your picks! Hope you have a lovely day! All of these dresses are so pretty! I just love sparkly clothing this time of year. The off the shoulder dress is my favorite. Nothing better than a sequins dress for the holidays. Want them all. i'm still thinking about my NYE outfit, these are some great options! Love a little sparkle for a holiday look! Great picks! Stunning dresses! I love them all! I haven't thought of what to wear but these all look so cute. Love sequins dresses! So pretty! You have such great taste, such gorgeous party dresses! 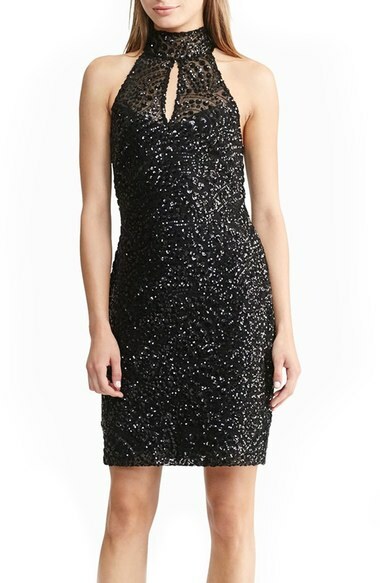 The high-neck sequin design by Ralph Lauren is stunning.